Whether she is gracing her presence in art galleries for performance art pieces, serving as an elegant muse to forward-thinking fashion designers, or commanding the silver screen with her alluring presence, Tilda Swinton is one of those rare few actresses in the entertainment industry with the incredible ability to transform herself into complex and unforgettable characters. 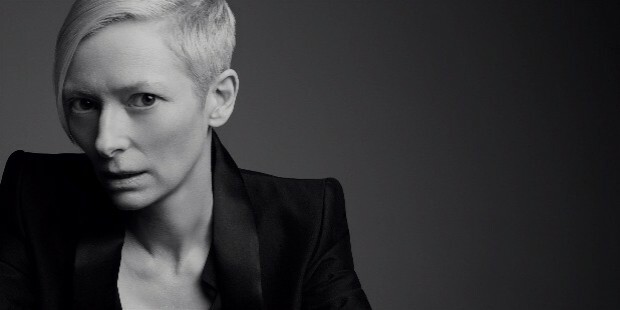 With her striking androgynous features, gamine and statuesque figure, singular sense of style, and uncanny acting skills that are bolstered by her metamorphic talents, Swinton is undeniably a vanguard artist whose star power isn’t beholden to the machinations of mainstream Hollywood. Born as Katherine Mathilda Swinton on November 5, 1960 in the United Kingdom, the British actress had a relatively upper-crust childhood and upbringing owing to the fact that her family is descended from an ancient Anglo-Scottish clan whose lineage dates back to the Middle Ages. She attended several independent schools during her youth and went on to graduate from the University of Cambridge with a degree in Social and Political Sciences in 1983. It was during her college years that she was first exposed to the world of acting by participating in theater and stage productions. A year after she graduated from college, Swinton joined the ranks of the prestigious Royal Shakespeare Company where she began to hone her acting skills. It was through her stage work that she would come to know one of her earliest film collaborators, the late director Derek Jarman. Swinton would go on to star in several of the director’s acclaimed independent arthouse films beginning with Caravaggio (1986). She would go on to win the first of her many accolades in another Derek Jarman production entitled Edward II (1991) where she nabbed the Volpi Cup for Best Actress at the 48th Venice International Film Festival. 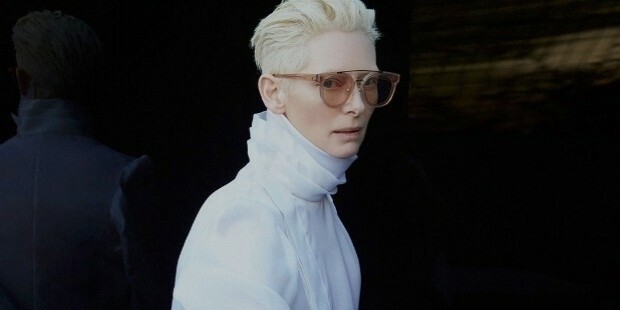 Even during her early film work, Swinton’s enchanting, unconventional beauty and penchant for playing eccentric roles that subverts the perceptions of gender was immediately apparent. Such was the case when she starred in director Sally Potter’s 1992 screen adaptation of Virginia Woolf’s novel, Orlando. She gradually began to attract buzz and attention from outside the independent film industry and soon enough, Swinton made the smooth transition into the mainstream film business. Despite this change of pace in her career, Swinton remained an autonomous figure who refused to conform to the conformist beauty standards of Hollywood since she understood the value of her avant-garde appeal. Although Hollywood fell in love with her acting prowess and her otherworldly physical presence, she was largely relegated to supporting roles since she wasn’t what many in the industry would consider as “leading lady material”. Still, she made the most of what she was given and soon proved herself to be a breakout actress by giving fierce life to what would have been one-note characters. Swinton brought complexity to her villainous archangel Gabriel in Constantine (2005) alongside Keanu Reeves; she exuded a deceptively dictatorial element to her vagabond earth mother and community leader in The Beach (2000) with Leonardo DiCaprio; and in a masterstroke of pitch-perfect casting, she reigned supreme as the imperious and icy Jadis the White Witch in The Chronicles of Narnia: The Lion, the Witch, and the Wardrobe (2005). Although Swinton continued to work on arthouse projects despite her breakthrough success in mainstream cinema, her persistence by working in Hollywood would prove to yield the greatest rewards that actors everywhere would dream of having. Her role as the ruthless and duplicitious corporate lawyer Karen Crowder in Michael Clayton (2007) with George Clooney would gain Swinton the Academy Award for Best Supporting Actress. 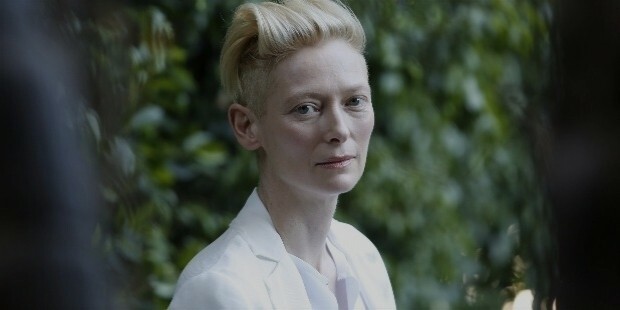 Finally gaining the recognition she deserves, Swinton has established herself as a prestige actress who is able to move deftly between indie productions to major blockbusters without ever losing her unique identity as an artist of the highest caliber. Other high-profile works that Swinton has done outside of the film industry include her work as a performance artist, such as the case with her piece entitled The Maybe, where she channeled both Snow White and Sleeping Beauty by sleeping in a glass case housed in museums or art galleries. She has also lent her presence to other artistic ventures such as doing high-fashion editorial work for many major fashion magazines, appearing in ad campaigns for some of the fashion designers she has formed friendships with such as Karl Lagerfeld for Chanel, and even appearing in surreal music videos like The Stars (Are Out Tonight) by the late and great English musician and actor, David Bowie. Such is the multi-faceted nature of Swinton and her dedicated patronage to the world of the arts that the Museum of Modern Art in New York City, with the cooperation of Chanel, honored her as the key tribute for their Annual Film Benefit in 2013. The event also doubled as her birthday party as she turned fifty-three when the gala was thrown in her honor. Attendees of this soiree featured luminaries from the fields of film, fashion, music, and visual art which included the likes of editor-in-chief Anna Wintour of Vogue Magazine, actor Ralph Fiennes, director Sofia Coppola, and musician Lorde. Swinton subscribes to the old-school preference of keeping to herself when it comes to her private life. She is the mother of fraternal twins Honor and Xavier Swinton Byrne conceived with her former partner, the playwright John Byrne. 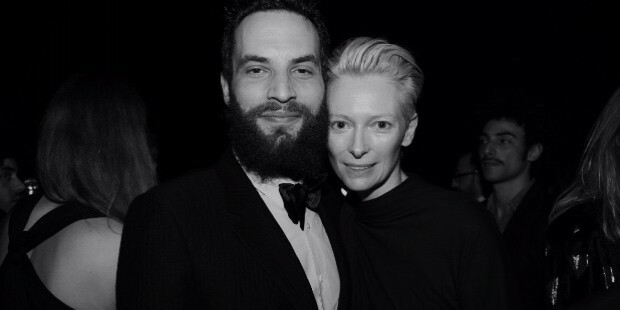 Swinton is involved in a relationship with a New Zealander artist named Sandro Kopp (pictured above with Swinton), whom she met on set while filming her role in the Narnia films. Together with Kopp and her twin children, Swinton resides in Nairn, located in the Scottish Highlands. 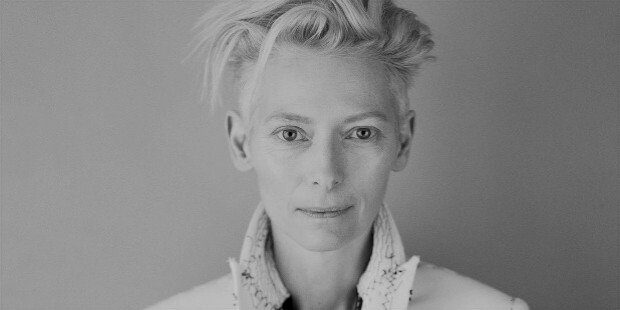 Apart from her Academy Award, Swinton is the recipient of other prestigious accolades such as a BAFTA Award and a European Film Award. She has also served as a jury member for prominent international film festivals in Berlin, Vienna, and Moscow. 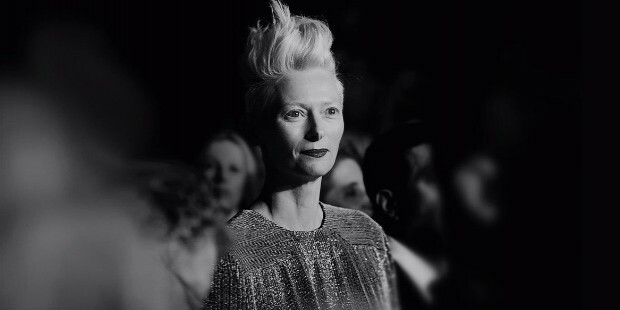 Swinton has also collaborated with fashion historian and curator Olivier Saillard on two fashion-oriented performance pieces entitled Eternity Dress and Cloakroom. She was selected by luxury automotive company Mercedez-Benz to star in a short fashion film featuring their S-Class Coupe and wearing custom clothing by her friend and fashion designer, Haider Ackermann. 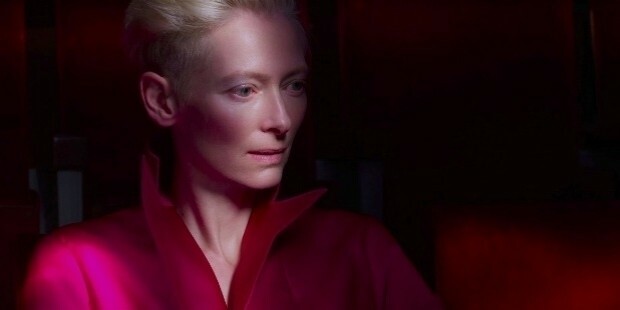 And in 2016, Swinton officially became part of the prestigious Marvel Cinematic Universe when she starred alongside fellow British actor Benedict Cumberbatch in the film adaptation of Doctor Strange. Swinton is one of the few Academy Award-winning actors who have joined the massive film franchise; an illustrious Oscars-Marvel club which also includes the likes of Sir Anthony Hopkins, Natalie Portman, Gwyneth Paltrow, Jeff Bridges, Benicio Del Toro, Tommy Lee Jones, Marisa Tomei, Robert Redford, Michael Douglas, Sir Ben Kingsley, Lupita Nyong’o, and Cate Blanchett.